What I learnt about sales from the angry subway preacher | @summon the founder! One of the advantages of starting up is that you get to choose where your office is. RideCell’s office is at the edge of the Georgia Tech campus and a 5 minute walk from the nearest MARTA (subway) station. I enjoy taking the train to work, having the luxury of basking in the beautiful sight that is Atlanta’s skyline in the morning sun. The 15 minute ride also gives me an opportunity to think about the “big picture” of our day to day labors. These days while Arun, Venkat and Sahiti handle a bulk of our coding, I spend a lot of time selling. I do at least five and some times fifteen calls most days with transportation and campus security folks at Universities around the country. Some are cold calls, some are qualified leads. What is encouraging is almost everyone I talk to agrees to see a demo and (literally) every one I have given a demo thinks we have a really useful product. What is frustrating is how long it takes to go from “This is an amazing product, we need it yesterday!” to “Let’s sign a contract”. Weeks, at least. Months, usually. This was on my mind today as I walked out of the MARTA Midtown station and sat down on a bench outside to wait for the Tech Trolley. About 15 feet away from me was an angry looking man, standing next to a large copper drum, waving pamphlets in the air and shouting. At first I thought he was a salesman, but turned out he was an angry preacher denouncing fake gods and chastising folks to follow him or burn in eternity. The brand of spirituality that he was selling: “my way or hell”, if it can be called that, was hardly to my liking. Neither was his style, in fact: I don’t like angry strangers who shout at me. But then it occurred to me: how many deals do you think this man ‘closes’ in a day? Heck, how many people actually even pay attention to him? Yet here he is, standing in a public place, selling his ‘product’, shouting at the top of his voice day after day. On the other hand, most of my potential customers actually take an hour out of their busy lives to see a demo, and even praise what I am selling. So it takes a few weeks to close the deal, big deal! I believe in the utility of my product more than he believes in his. Heck, unlike him, I got stats to back up my beliefs! So if he can stand out there, shouting hour after hour at people who ignore him in the hopes that even if he doesn’t ever get to know about it, may be one of them will look into his brand of spirituality, what right do I have to complain? 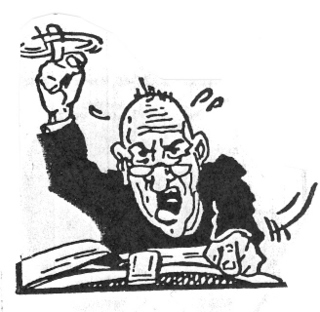 TL:DR; When you get frustrated with long sales cycles, think of how bad it is for the angry subway preacher!